You are here: Home / Mission / What Does the Library Mean to You? 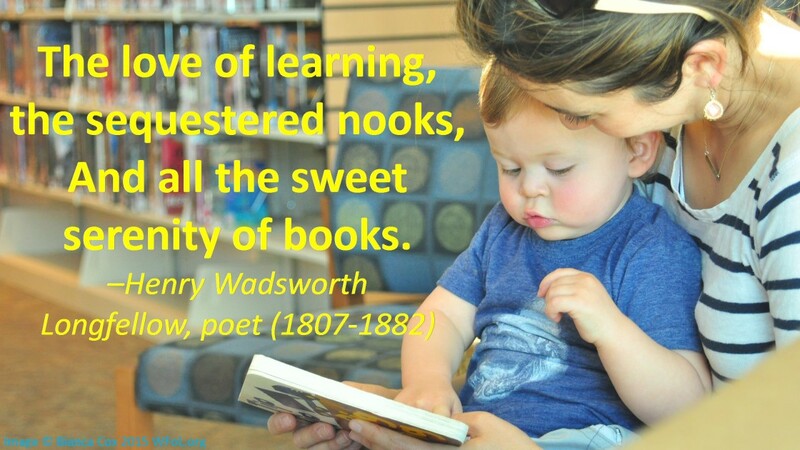 Of course, Longfellow was writing long before the internet, audiobooks and community meeting rooms and many of the resources and programs that make up a modern library. Members of the Winters Friends of the Library support the library in many ways. Many donate as well as volunteer to work hard to support the library that we love. Of course we always try to have some fun while we get things done, but let’s take some time to play with words and tell a tiny story about what the library means to you. How would you define the library or why it is important to you? Can you do it in a poem? A Haiku? A six word story? Longfellow used just 20 syllables to tell his library story, what will you do? Go ahead, give it a try. Play with your words and then send them to us at reply@wfol.org by October 12. We would love to hear what you have to say and make a display of your ideas for our Annual Membership Gathering on November 2. So, please create and save the date.